Hope you had a wonderful weekend - ours was really so very sweet - it was filled with lots of slow moments - you know those kind of moments that seem to last forever - we had such great weather this weekend and so the kids were able to play outside and ride their bikes and it was such a delight to just to "be"... I went to bed so early every night - and woke up ready for the day - and I am actually so excited it is Monday - because this is a going to be a super fun (albeit busy) week! So I got my cup o' decaf joe ready in one hand and my calendar planner in the other - and I am ready to check off all of things in my "to do" list!!! woot! Accessories: Martha Stewart lace punch, corner chomper (1/2"), Adirondack liquid pearls (terra cotta), spellbinders, cuttlebug swissdots, ribbon from stash, Kaiser bling, dimensionals and copics. A huge thank you to Starving Artists DoodleFactory this week for being our sponsor!!! 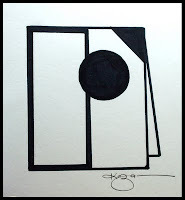 I hope you will check out all the amazing samples that the DT has made and play along with the sketch this week over at 2 Sketches 4 You!!! You could win some amazing yumminess!!! Big hugs and Happy Monday! Some Exciting News: Three Letters: C H A !!!!!!!! I am so excited to actually say that I am going to CHA it up this year! CHA stands for Craft & Hobby Association and is a manufacture trade show where new products are revealed and retail stores have an opportunity to place their initial orders. This year Taylored Expressions is going to be exhibiting at the CHA Craft SuperShow in Anaheim, CA and will have a booth there this year! 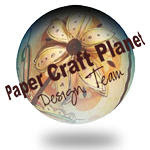 While the tradeshow is more for retail stores, the CraftSuper Show (Jan 22-23) is for all us crafters! It is open to the public and will be filled with hands on educational experiences with all the different modes of craftmaking (Scrapbooking, stamping, beading, knitting, etc.) as well as make and takes and of course s-h-o-p-p-i-n-g!!! For more information on the event, please check out Taylor's Blog and also click here! Discounted tickets are available for all Taylored Expressions customers and friends! Just click on the image to the left to purchase your tickets and be sure to enter the promo code CRAFT15 to receive the discount! If you are going - give me a holla! Would love to meet you!!! Will be back soon with a sketch challenge card!!! 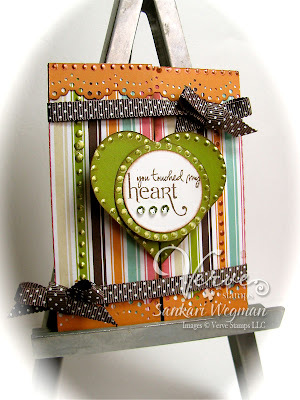 Verve November Release Thankful Hearts Blog Hop! and lots of prizes - check out all the beautiful samples and details here on the Verve Blog! 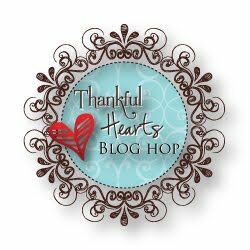 Since today is the release of all the new Verve Yumminess we’re topping off our Thankful Hearts Blog Party with a blog hop featuring three new sets that just released, all focused on thankfulness. If you’ve been hopping and arrived from Teresa’s beautiful sunshiney blog , then you’re right where you should be. If you’ve just happened by, then you’ll want to hop on over to Julee's Blog: Poetic Artistry to start from the beginning! And to make this hop even sweeter, we’ve got a special treat hidden along the way for one lucky commenter. So if you see something that makes you smile, be sure to give a little shout-out in the comments for a chance to win our entire release! 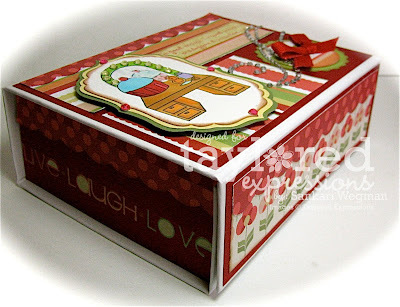 I created three thankful samples for today's blog hop party :) The first uses Jen dM and Susan's awesome challenge to create a Mini Pizza Box (which is challenge 4 of the five challenges on the Verve blog that you can play for a change to win some yummy Verve stamps!). I used the Celebration of Thanks stamp set to create this Pizza Box - I adore the font on this set - it is so elegant and beautiful! Paper: Prism Cardstock Ink: Memento Rose Red and Aquamarine and Color Box chalk, Stamps: Heartfelt Accents stamp set:, Accessories: spellbinders, dimensionals, , liquid pearls, ribbon from stash and bling from Kaiser. THank you so much for hopping over here! 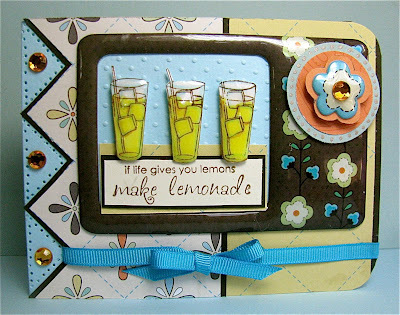 Next up on the blog hop party circut is the awesome Jen del Muro - so hop on over and check out her beautiful creations! Hope you all had a wonderful Thanksgiving! Have you been checking out all of the happenings on the Verve blog today?!!! 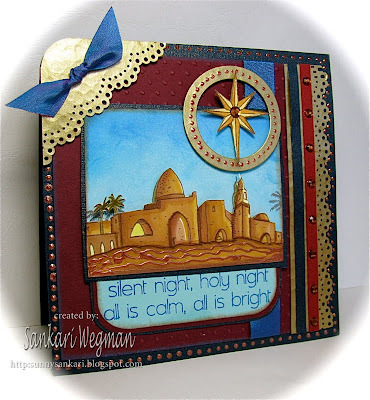 Today, Julee will be releasing some amazingly beautiful sets over at Verve Stamps at 9pm EST! - but every hour on the hour today, there is a post that will be revealing different peeks and different challenges which you can play for a ton of prizes!!! Right now, Jen Tapler and I are up with the last Verve Challenge for the night (Challenge #5) which we are calling the Gift Card Challenge! During the holiday season, we often want to thank so many people around us for all of their service and hard work all year long (like the mailman, the hair stylist, etc.) and its nice to have some gift card holders on hand! 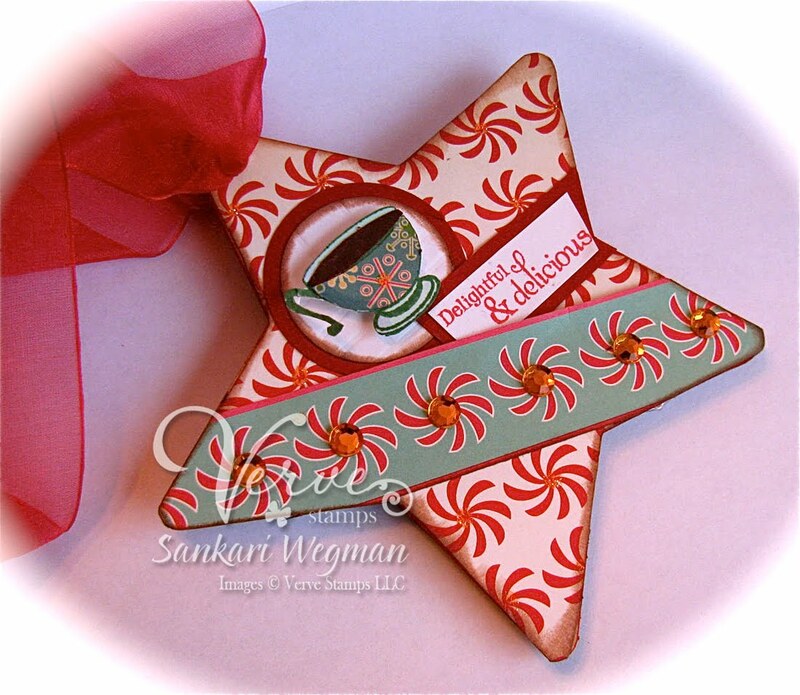 So our challenge to you is to create a gift card holder of your own. You can create a gift card holder for birthdays, as a thank you, for anniversaries, for the holidays - whatever theme you would like! 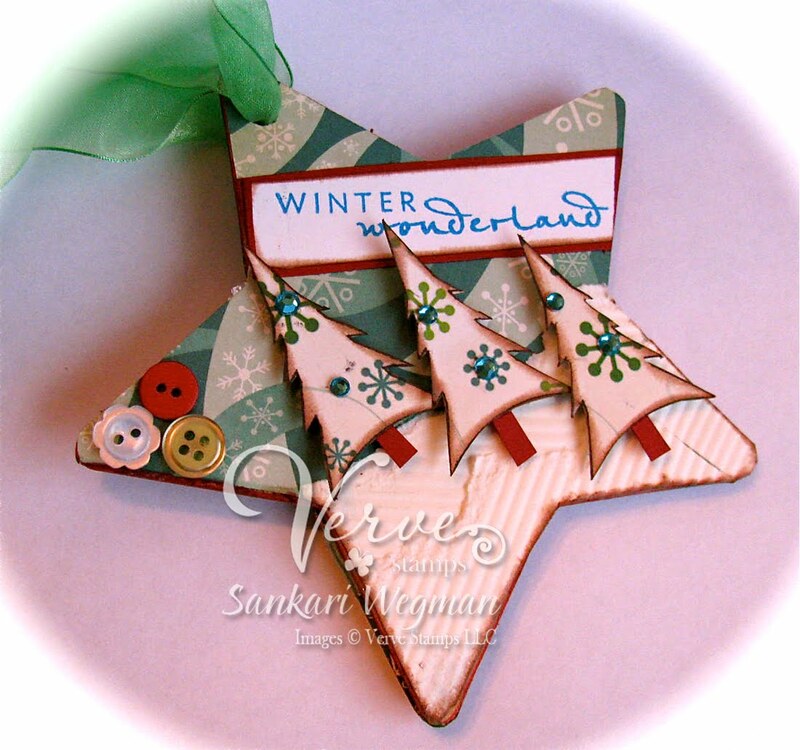 We are enclosing some links to some gift card making tutorials to help get your mojo going! Paper: Prism Cardstock, DP from American Crafts Stamps: Thankful Hearts from Verve, Ink: Memento Tuxedo Black, Rose Red and Aquamarine, Accessories: Spellbinders, eyelets, sakura glaze pen, ribbon from stash and dimensionals. 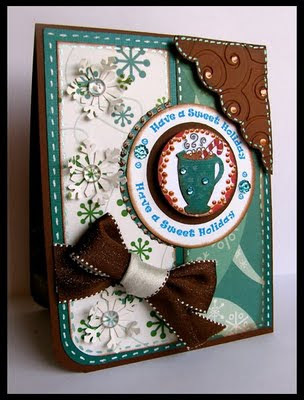 Paper: Prism Cardstock, American Craft DP Stamps: Thankful Hearts from Verve, Ink: Memento Expresso, Accessories: Ribbon from stash, dimensionals, 1"circle punch, corner rounder, Martha lace edge punch, liquid pearls and Kaiser rhinestones. There are so many different ways to create a gift card holder and we can't wait to see what kind of gift card holder you create!!! 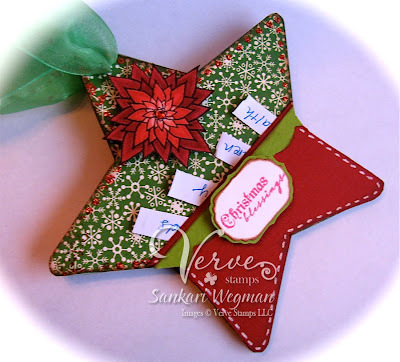 If you need some ideas on how to make one: are some tutorials from SplitcoastStampers: Gift Card Tutorial 1, Gift Card Tutorial 2. Can't wait to see your creations soon! 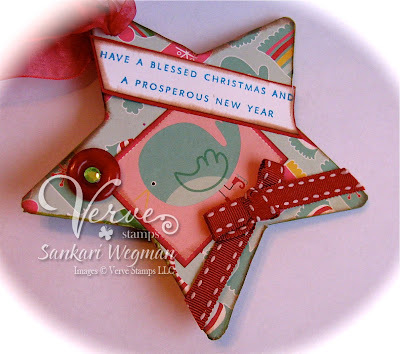 Check out all of the challenges and Sneak Peeks and Stamp Set Reveals over at the Verve Stamps Blog !!! And stay tuned to the release of all of these beautiful stamps at 9PM EST followed by a wonderful blog hop all of which are coming up soon!!! Hope you had a wonderful Thanksgiving!!! We had a lovely time celebrating with dear friends and are still stuffed from all of the yummy food! We are staying away from all the Black Friday sales in the store - and rather, I am shopping online for Black Friday magic :) Speaking of which Taylor has an amazing sale going on at Taylored Expressions today!!! In honor of Black Friday and Cyber Monday (the two biggest shopping days of the year! 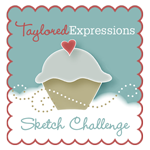 ), Taylored Expressions is offering 15% off everything in the store! Just use the promotional code TEBlackFriday upon checkout to receive the discount. You don't want to miss up to 50% off all JustRite products, Buy 2 Get 1 Free on Tiny Twinkles, and the new TE Shirts & Aprons! I had a ton of fun making this perfect package and can't wait for Christmas to give this away to our niece!!! Check out all of these AMAZING stampers and the gorgeous perfect packages that they have decorated!!! Thank you so much for stopping by today!!! I hope your Black Friday shopping brings you great deals!!! I am excited to sit in my PJ's and do some online shopping!!! Big hugs and thanks to all!!! What a busy time it is right now!!! Do you find yourself running errands and then forgetting what you were supposed to do even though you have a list? lol! I think that's a sign of things being too busy! 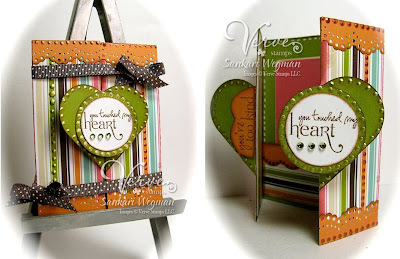 Well, I am so excited today to share 2 things with you - a card and peek! 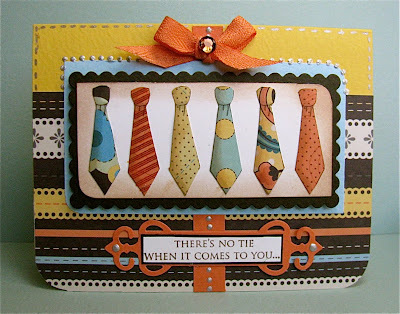 And guess what - its Day 2 of being a Guest Designer for Just Rite stamps!!! I LOVED making these little "oval" creations" because I think I am "oval challenged :)". 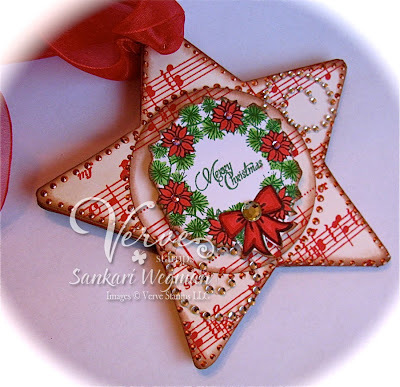 I also am vintage challenged - so I challenged myself to create some oval vintaged projects :) Here is a peek of my project - the rest you will find on the Just Rite Blog - you can click HERE to see the rest! Hope you are all having a fantastic day!!! Just Rite Guest Designer - Day One! Hope you liked the peek! Hope your Monday is going fabulous! 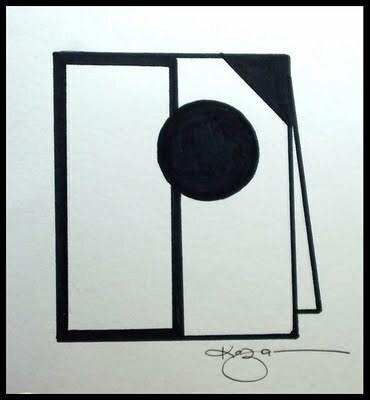 2 Sketches 4 You - #40 - Have a Sweet Holiday!!! Today is Monday and that means its time for another yummy sketch from the lovely ladies at 2 Sketches 4 You - where this weeks sponsor is the Just Rite Stamp Company. If you are not familiar with the Just Rite stamps, they are rubber stamps on wooden mounts that can have interchangeable borders and sentiments, along with individual letters with different typeset fonts that allow you to create your own sentiment!! For my card, I used the yummy Bo Bunny papers to create this card with the sentiment: Sweet Treats using the Just Rite stamp: Something Sweet Borders and Centers Round 2 3/8". 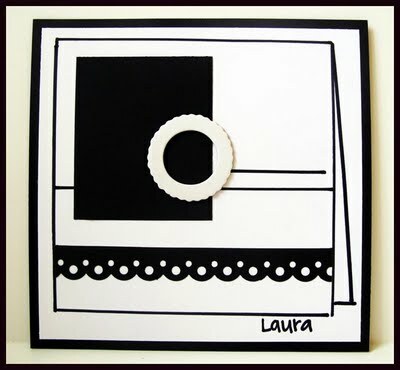 Stamps: Something Sweet Borders and Centers Round 2 3/8". Accessories: corner chomper, Inkessentials white gel pen, Adirondack Liquid pearls, martha stewart snowflake punch, dimensionals, circle punches and corner rounder, ribbon from stash, cuttlebug folder waves, bling from Kaiser and dewdrops. A huge thank you to the Just Rite Stamp company for being the sponsor over at 2 Sketches 4 You and one lucky person will get some YUMMY Just Rite stamps - hop on over to the 2 Sketches 4 You blog and see all the yummy creations from the DT and all the details on how to get some Just Rite stamps!!! Sending you all lots of sunshine and hugs and wishes for a "just rite" ;) kinda day!!! 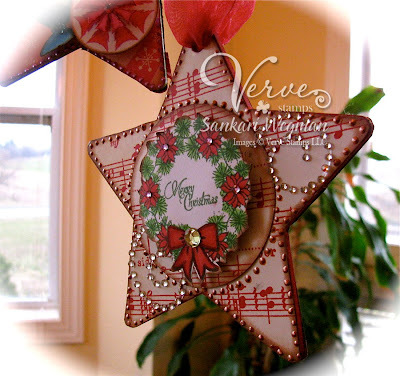 Have you been checking out the amazing creations over at the Verve Stamps Blog!!?!!! 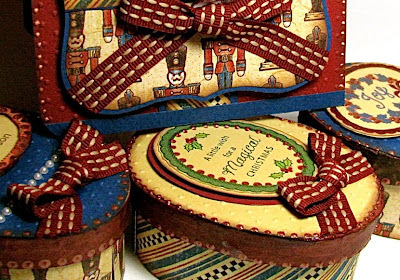 The challenge that all the Divas were given is to create holiday decor and home accents for under $10.00! I have been loving peeking at all the amazing and gorgeous samples that the Divas have been making every day - and they maybe under $10 - but they look a million bucks to me!! 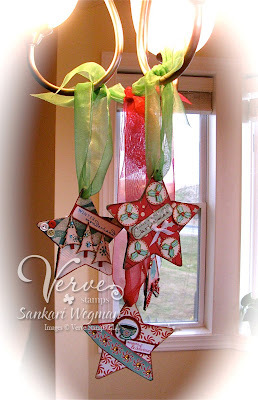 So for Day 12 of the challenge of creating home decor and accents for under $10 - I created a little hanging chipboard star mobile to hang from our light fixture in the dining room. We are always hanging around the dining room table - whether it is for meal times, snack times or craft time with the kids - I thought it would be nice to decorate that with a starry mobile :) The total cost of 4 chipboard pieces were $2.99 and each of the ribbons were only 50 cents - bringing up the total to a grand ole: $4.99 (plus tax) - gotta love that! Each star measures approximately. Each one was colored in on the edges and then I traced the star shape onto the Jolly by Golly paper pack from Cosmo Cricket (there are 8 star shapes from each paper pack for the stars and then I adhered the paper onto the stars with some zip dry. . I absolutely LOVED making this project and love that we can use it every year! 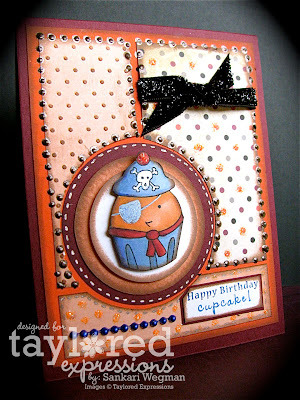 I LOVE all of the wonderful sentiments that Julee has in each of her stamp sets along with the gorgeous images! It totally makes it a breeze to create a project like this! 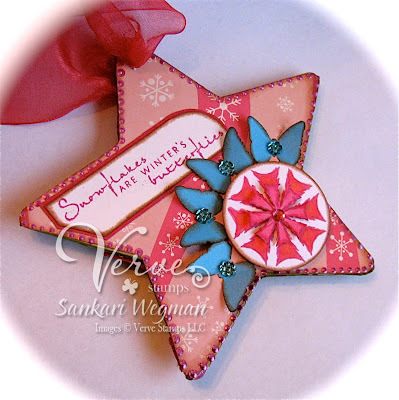 The first star has one of my favorite sentiments: "Snowflakes are winter's butterflies" and this sentiment and the two snowflakes are from the set: Christmas in the Air. On the back of this star is this gorgeous sentiment from Blessed Christmas: "Have a blessed Christmas and a Prosperous New Year". The third star is one of my faves - I love this little winter scene created from the gorgeous set Christmas in the Air.- where I paper pieced the Christmas tree and then created a little snow scene with some crimped snow, popped up trees and some little buttons to the side. 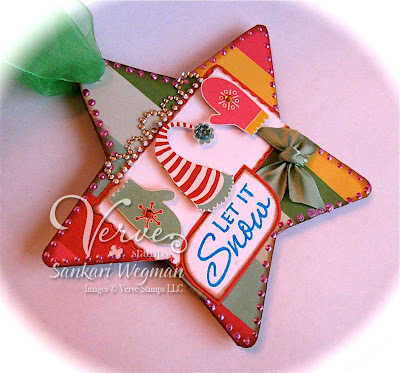 On the back of this star, I used the sentiment "Let it Snow" from the stamp set: "Let it Snow" and I cut some of the hats and mittens out of the paper to create a little scene. So, now it's your turn! We'd love for you to play along with us and show us your homemade goodies for the upcoming giving season! Verve stamps are not required, but if you've got 'em, why not use 'em? 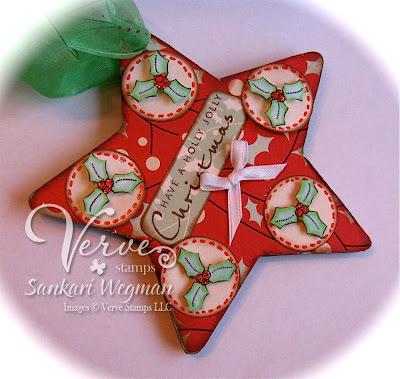 Please hop on over to the Verve Stamps blog for more yummy details for this challenge!!! AND one lucky commenter during the course of the parade (which is there for 3 more days!) will win their choice of any Verve Set!!!!!! Check out all the details here!! Thank you for visiting today and I hope you are having a lovely weekend!!! We thought that we could kick off the celebrations into Thanksgiving with the 7 TIME Oscar Award Winning Movie: "Shakespeare in Love" (It won 7 Oscars for: Best Leading Actress, Best Supporting Actress, Best Picture, Best Screenplay, Best Costume, Best Music and Best Art-Set Decoration!!!). and if you haven't yet seen it - you can watch an edited version of the whole movie on Youtube (start with this link and then click on the next ones for subsequent links for the movie). Since in the movie - Viola goes out of the box to play a male role - we thought - we could have our challenge be to create something that is out of the A2 box: sooooo, the challenge requirement for this movie is to create a card that is not an A2 (a typical card is A2 (measuring 4 1/4" by 5 1/4") - but if you would like - have fun to create a "shape" card - meaning, it could be a circle, a square, anything at all that you would like!! Or - it doesn't have to be a "card" at all!! 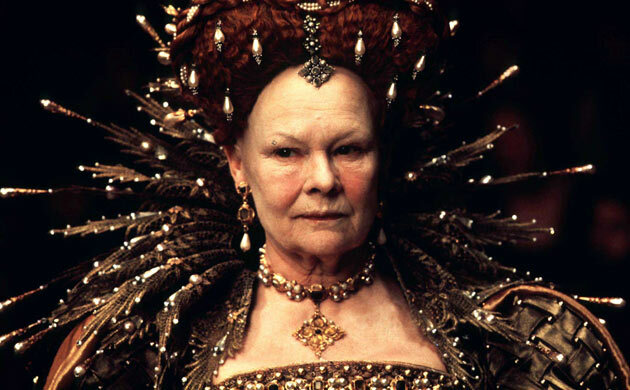 I created a "Dare to be You" card that is inspired by Viola's Daring but is inspired by Queen Elizabeth's (played by Dame Judi Dench) dress. So are you ready to play along this week!!!!!! 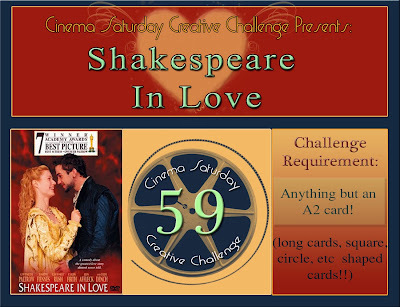 Well, all you have to do is to create a card, layout, altered project etc that is inspired by the movie:Shakespeare in Love! Your inspiration can come from the costumes, the dialogue, the music, the themes, the characters, the colors - anything at all from the movie! The only requirement this week is that it shouldn't be an A2 card - so go out of the box and play along!!!!! 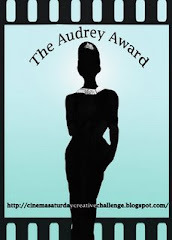 Please check out the CInema Saturday blog for more inspiration and more creations from this movie!!!! I had fun with my out of the box A2 creation and can't wait to see everyone's Shakespearean creations!!! Hope you are having a lovely Saturday!!!! Fabulous Fall Key Ingredients Blog Hop!!!! Here is a second card that I made using the new set that Taylor released this month called Sweet Indulgence: I love that Cuppie is having a chance to relax! 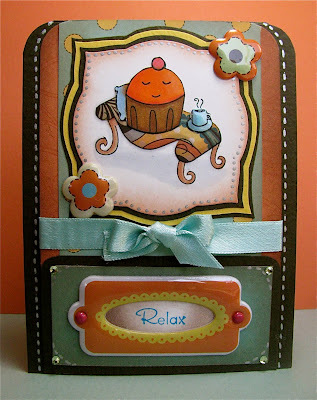 I used the little puffy embellishment to create a little frame around the word relax and then added some brads to it - super peasy easy!!! The papers are super fun and are so easy to work with and the matching cardstock that goes with them are perfect - there is a ton more of papers in this set and I can't wait make more cards with them!! Taylor is releasing 4 total Fabulous Fall sets today!!! And get them quick - because they are available only for a limited time and when they are gone - they are gone! I can't wait to get some too!!! Here are all 4 that Taylor is releasing today and check out all the Baker's Dozen chefs that are sneaking peeks of these yummy sets!!!! 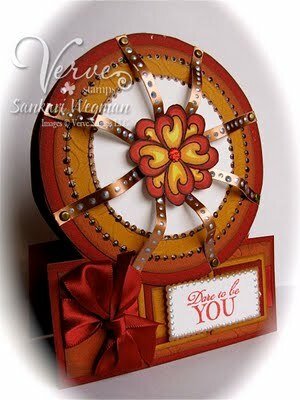 Petals and Paisley -- my dear friend Donna has some amazing peeks with this awesome set!!! Morning Medow - Charmaine and Denise have created some yummy magic with this set!!! Penelope's Potpurri - Taylor & Karen G. have created some awesome creations with this one!! Winnie's Walls - check out Karen Motz and Jodi Collins beautiful creations with this set!!! I am off to shop!!!! Thanks so much for stopping by today!! Hope you are having a FABULOUS day!!!! Birthday BLog Hop for Nancy!!! 2Sketches 4 you - #39 - You're so sweet!